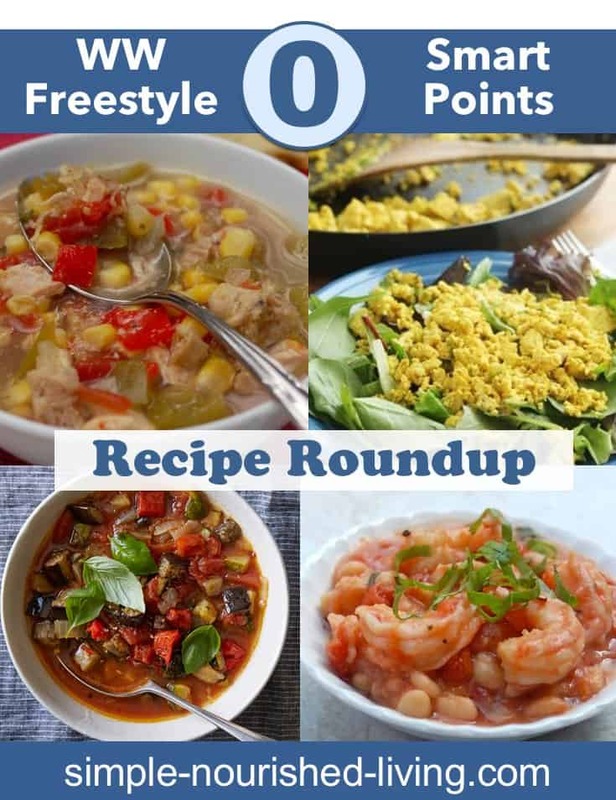 Today I’m sharing a recipe for slow cooker Southwest Chicken Soup that has Zero WW Freestyle SmartPoints. It’s soup season and I couldn’t be happier. I love soup. Soup is tasty. Soup is filling. Soup freezes well. Soup is my secret to successful Weight Watchers weight maintenance. 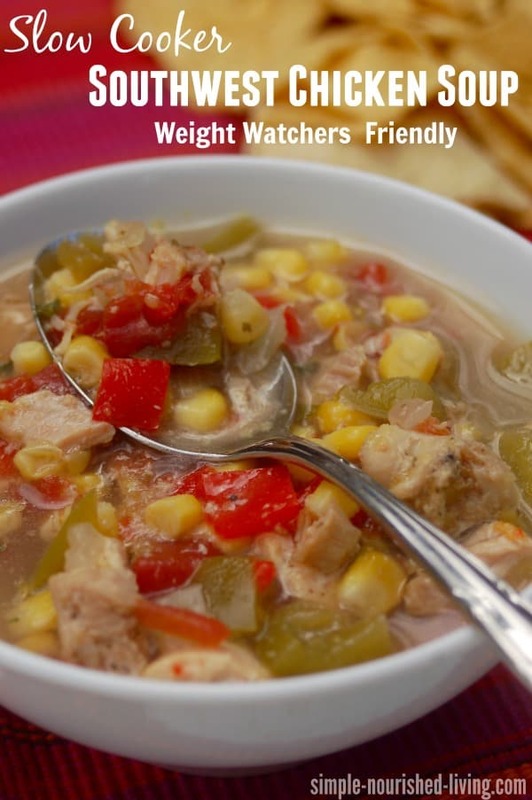 This Skinny Slow Cooker Southwest Chicken Soup is adapted from a recipe in the Taste of Home Best of Comfort Food Diet Cookbook (affiliate link). Flavorful without being too spicy, it’s the perfect recipe to make on a busy day when you’re short on time because the slow cooker does most of the work for you. We all thought this simple southwest chicken soup was delicious. If you like bolder/spicier flavors, kick it up with a pinch of cayenne and/or few dashes of hot sauce. This is a easy and healthy soup that I will definitely make again. Enjoy as is, or garnish with a sprinkling of shredded cheese and/or chopped cilantro if you like. This makes a big batch so you can freeze leftovers in individual portions for quick and easy future meals. According to my calculations each serving has 143 calories, *4 Weight Watchers PointsPlus and *0 WW SmartPoints (new WW Freestyle Program). Enjoy! veggie rich – add more veggies, carrots, celery, cauliflower, zucchini, yellow squash, lima beans, sweet potatoes, butternut squash, etc. different – substitute chicken sausage, turkey, or pork for the chicken. Chicken or turkey meatballs would be good too. Just be sure to adjust your SmartPoints accordingly. 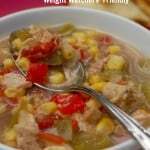 If you’ve made this Southwest Chicken Soup, please give the recipe a star rating below and leave a comment letting me know how you liked it. Easy to make and flavorful without being too spicy, this lightened up southwest chicken soup is a winner in my book. Place the chicken in the slow cooker. Sprinkle with seasoning and toss to coat. Cover and cook on LOW for 6 to 8 hours, or until chicken and vegetables are tender. Gee, maybe I’m missing something, but there is no recipe for Southwest Chicken Soup listed here. Are we not supposed to have the recipe? Sorry about that! The recipe is there now!! If I’m using precooked chicken (leftover from a roasted chicken), what would the cooking time be? Thank you. Hi Kliffb, You just need to cook it until the vegetables are cooked to your liking. Depending on your crock pot I would think that 4 hours on low would be enough. Hope this helps. This is one of my favorite soups. Easy, delicious and filling. I make it frequently.